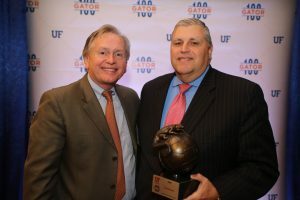 GAINESVILLE, Fla. – Two Industrial and Systems Engineering alumni were named to the University of Florida’s inaugural 2015 Gator100 during a ceremony Feb. 6 at UF’s J. Wayne Reitz Union Grand Ballroom. 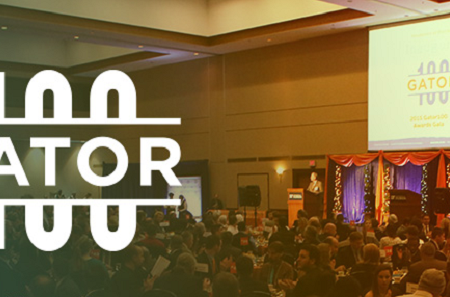 Sponsored by UF, the Warrington College of Business Administration and the Center for Entrepreneurship & Innovation (CEI), the Gator100 recognizes the 100 fastest-growing businesses owned or led by UF alumni. Ernst & Young calculated each company’s compounded annual growth rate (CAGR) over the past three years to generate the ranking. Voalte, led by Trey Lauderdale (BS ’04), was ranked 15th with a compound annual growth rate (CAGR) of 84.17%. In addition, Virtustream, led by Rodney Rogers (BS ’87), was ranked 74th with a compound annual growth rate (CAGR) of 29.54%. Founded the company and been active as a member of the most senior management team from Jan. 1, 2011, through Dec. 31, 2013.